Welcome to the page of Police & Defence Jobs. In this section you can find the details of latest Police & Defence Vacancy. 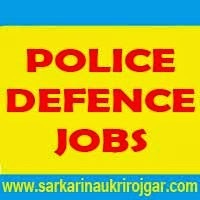 Get full details of all Police and Defence Jobs Like Indian Army, Indian Navy, Indian Air Force (IAF), Border Security Force (BSF), Central Reserve Police Force (CRPF), Central Industrial Security Force (CISF), Indo-Tibetan Border Police (ITBP), Railway Protection Force (RPF), National Security Guards (NSG), Special Protection Group (SPG) and Sashastra Seema Bal (SSB). You can get all the recent employment notification of Police & Defence Jobs directly in your mail inbox through our free email alert service. Subscribe our free job alert for Police Jobs & Defence Jobs 2018.